Teaching children to treat each other with respect is an important part of school that can make the difference in the success of your classroom. Try some of these activities, broken out by age group, to help mold student behavior throughout the year. Bucket-filler Friday - Take time once a week to have students encourage each other. This could be via written notes or circle time to give each other compliments. Recipe for Success - Students post "ingredients" for the recipe of what good character looks like. You could do a group brainstorming session or have children write and draw their recipes. If space allows, make a bulletin board with the ideas. Make It Mine - Let kids define character traits in their own words and share an example of someone they know who displays that positive characteristic. Puppet Role Play - Use puppets to have students act out a conflict and resolution. This can also give insight into the interpersonal issues your students are facing. Growing Gratitude - Use the door of your classroom to build a paper tree or flower and put things your class is grateful for on the branches or stem. Make it a weekly activity. Walk in my Shoes - Trace feet and stand in someone else's footprint while discussing examples of empathy. Button Pushing - Cultivate a classroom culture that identifies "buttons" that cause stress or anger and have students work toward avoiding button pushing. Interactive Character Notebook - Compile ideas for handling anger or bullying, as well as suggestions for acts of kindness and how to show a teacher respect. Review the notebook on a regular basis to reinforce good behavior. A Bad Case of the Stripes - This book by David Shannon is a great jumping off point for talking about individuality, laughing at others and incorporating other character issues. Workplace Ethics - Many older elementary programs incorporate a unit on business ownership or careers, and this is a great time to talk about the idea of ethics and good business character. Help others by planning a donation drive with an online sign up! SAMPLE. Don't Be Salty - Give students a salt packet and have them dump it on a napkin. Tell them to put the crystals back into the pack. This is the same as our words — they are difficult to take back. Door of Integrity - Remind students on the door that integrity means showing good character wherever we go outside the classroom. Helpful vs. Hurtful - Have students look at magazines or at social media posts and talk about which words can inspire and which words can be hurtful. Big Kid Show and Tell - Have students bring in items that convey their individuality or unique experiences and talk about empathy and diversity. Audience of One - Middle schoolers can struggle with peer pressure and who is watching them. Help students stay true to themselves with activities that emphasize their individuality (and help them to express it in a positive manner). Citizen of ___ (School Name or Teacher's Name) - Integrate lessons of global citizenship with how “citizens” of a school or classroom have responsibilities and a moral code. Judging Someone By His Cover - This is especially effective during election seasons. You can talk about how the character of politicians (or celebrities) are judged and manipulated. Paying It Forward/Golden Rule - Discuss how students can be grateful for help they have received and "pay it forward" by doing kind acts for others. Strength Finders - Help students identify their strengths and identify how those qualities can help them become a "mentor"' in the classroom who can help others. Peer Buddies - If your school has a classroom for students with special needs, assign them a peer buddy nominated by teachers to encourage empathy and serving others. TED Talks – Either pull up some favorite inspirational speeches that emphasize good character traits or have students plan their own TED Talks to share their stories about perseverance and hard work. Wheel of Wonder - To encourage kids to be on time to class, create a wheel of consequences they have to spin if they are tardy. "Punishments" can include singing a song of the class' choosing in front of everyone, dancing in front of class or reading a recent text message. If you’re feeling generous, include a space on the wheel where the tardy student is exempt from punishment. Text to Talk – It’s a reality that teenagers spend a lot of time on their phones, but challenge students to turn short texts into longer real-world conversations in order to explain their opinions or points of view about different character issues. Personality Types - Have students take a personality quiz to figure out the strengths and weaknesses they bring into group work settings. Then assign them teams and projects that will help them work on these skills. One-Minute Etiquette Class - Do kids today even know what the word means? Teach them by giving them one-minute “life lessons” on a range of topics from how facial expressions affect professional opinions of them to the proper basic table manners at a business lunch. 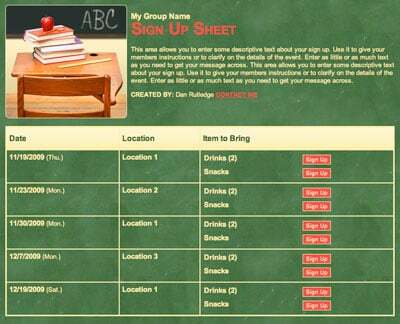 Organize school service projects with an online sign up! SAMPLE. Bullying Prevention - It seems like bullying gets a lot of attention in the elementary years, but what does it look like as a teen and how can it be handled? You’re likely to notice bullying that has moved online or via other digital networks. Have students share mean comments they’ve noticed on social media and talk about better ways to communicate. Set clear parameters so students can share without bashing another student’s behavior directly. Social Media Checkup – Speaking of social media, more college admissions departments are checking students' social media profiles during the application process. Talk to students about what’s appropriate to share publicly versus privately — but don’t give a pass on negative language just because it might be on private digital channels. "I'm Not Your Mom" - Use this theme to talk about responsibility in the real world. Differentiate between what is a student's responsibility versus a teacher’s or a boss.’ This knowledge is particularly important as students start taking part-time jobs or entering college. Nobody Likes A Tattle Tale – Bigger kids have bigger problems, from entering into unhealthy relationships to dealing with depression. Talk to students about how to navigate these scenarios. It can be tough to balance a perceived need to manage social status versus doing the right thing. Discuss different scenarios and the pros and cons of reporting (and who to report to). Difference Makers - Plan service-learning opportunities, so students have a chance to get outside of themselves and help others. Talk is great, but putting good character into practice is even more important. 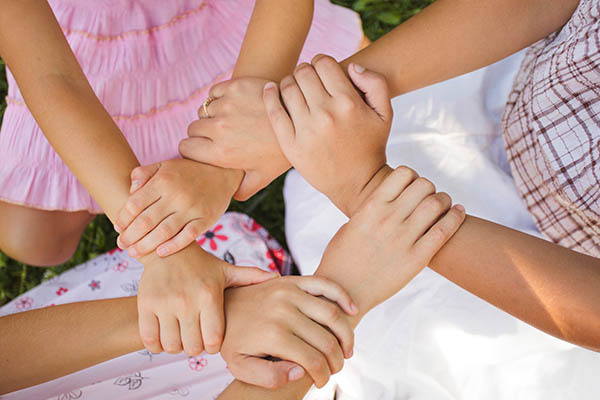 Genius Tip: Try these 50 community service ideas for teen volunteers. Whether it’s a simple catchphrase you repeat every day or planned character lessons throughout the school year, shaping your students’ behavior is an important matter. With the right guidance, you’ll be making a difference for years to come. Julie David lives in Charlotte, N.C., with her husband and three daughters. She’s a former teacher. 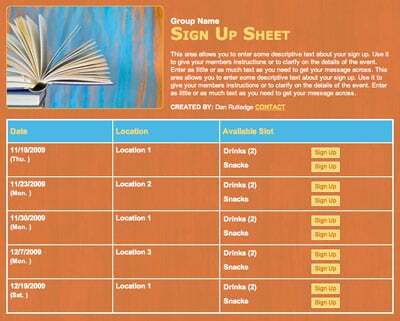 Plan the school book fair with an online sign up.